La ville millénaire de Marrakech, ancienne capitale du Maroc, regorge d'histoire. Toutefois, la plupart des voyageurs passent à côté des détails essentiels. 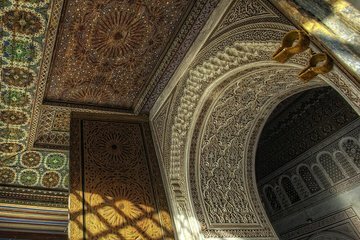 Au cours de cette visite approfondie sur le thème de l'histoire, vous découvrirez des siècles d'architecture, de traditions et d'événements. Voyagez confortablement entre les sites touristiques à pied ou dans un monospace climatisé, et profitez du transfert depuis l'hôtel. Les points forts incluent les marchés de la casbah datant du XIIe siècle, les ruines d'un palais du XVIe siècle et le quartier juif de la ville. The tour was okay, not phenomenal. The guide was nice and spoke wonderful English. We went a lot of places and could take pictures which was fun. We were both really interested in history, but didn't find this tour to be that interesting. Also note that the entrance fees into the places are not included. We went 3 places with fees and at each place had to pay 10 dirham per person. That's only about 1 dollar, so not expensive, but I just wanted people to know. At the end, the guide took us to an herbal medicine pharmacy and we got to see Argan oil being made. The owner showed us many things oils, spices, lotions etc. which was cool. We decided to buy stuff there, but ended up regretting it. We had assumed that since it was part of the tour, we would not have to haggle, but we were wrong. When they rang up the price, it was insanely expensive which caught us off guard. We were shocked, hate haggling and didn't know what to do, so we just paid it. We really felt bad since we spent more than we had wanted so it put a cloud over the rest of the trip.